It's been a few months since I've been able to attend a Yelp Elite Party, due to things like working too much, training for an Ironman, and oh yeah, planning a wedding. 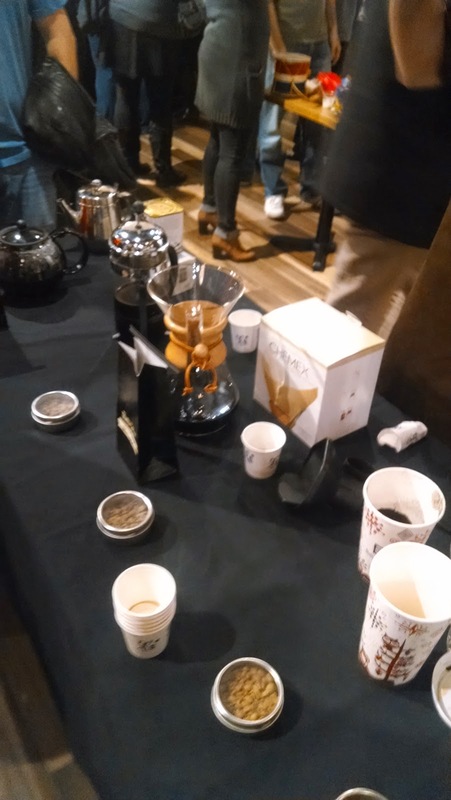 But last Wednesday I remedied that situation at Yelp's Elite Event at Peet's Coffee in Wheaton. Plus we were able to take +1's so Matt was able to pop his Yelp Party cherry! About a year ago, Caribou Coffee sold off its Chicago area market to Peet's Coffee. 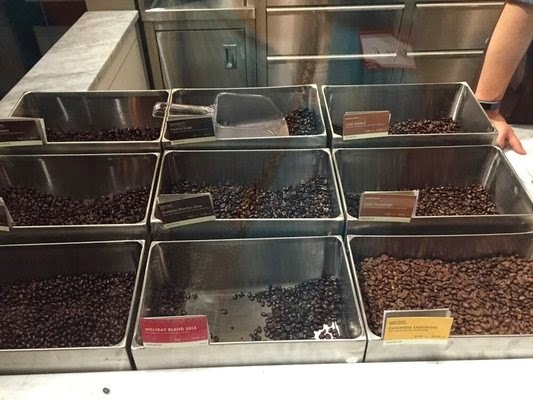 Peet's has been opening some new stores in the city and now they've opened one in Wheaton. Chicago got hit with a terrible cold snap (thanks bombogenesis!) so I was so glad to finally get inside the cozy coffeehouse. I parked in a parking garage and walked only about 5 minutes to get inside with a winter coat, a hat, and gloves, but I was still freezing. I really have no idea how I will survive winter because my hands are already freezing 85% of the time. I already planning my beach vacation for February. 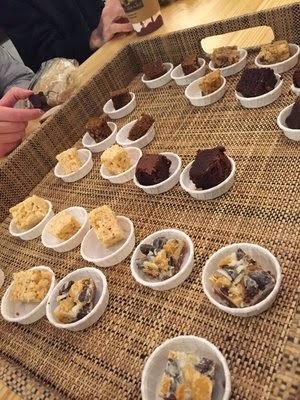 The Peet's staff was walking around with all sorts of samples including drinks and food. In no particular order, I tried a sea salt caramel mocha, dark roast coffee, rice crispie treat, banana walnut bread, and cookies. I'm sure I'm leaving things about but they pumped me full of so many sweet treats my memory was altered. Plus we could try a full-size drink of anything on the menu. Since I needed food before I got the caffeine-shakes too terribly (I am fairly sensitive to caffeine and a strong cup of coffee in the morning gives me the shakes! ), I picked up a cheese and fruit plate to snack on. Matt picked up a turkey sandwich and we shared bites. 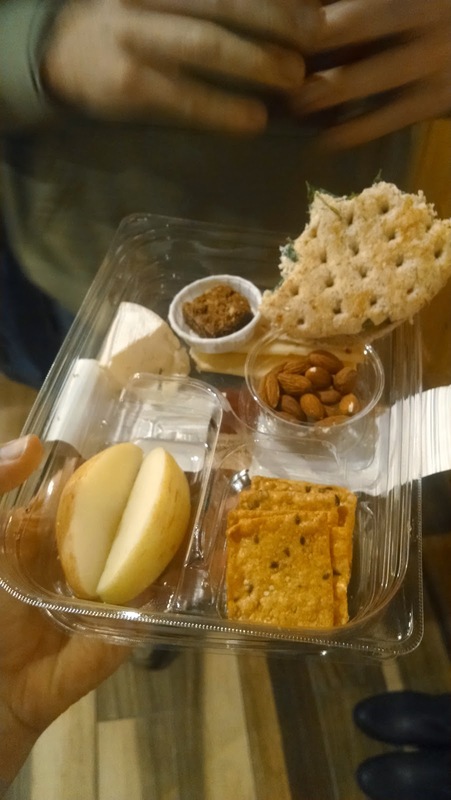 The cheese platter was really good and included brie, Parmesan, pepper jack, almonds, crackers, and apples. I also tried a full-size of the Jasmine Lime tea cooler. Matt was not a fan due to the sourness of the lime but I like that puckering sensation. The staff had a few demonstrations set up including letting people behind the counter to watch how drinks are crafted and this demonstration below with different methods for brewing coffee. It was very interesting to compare and contrast the different methods for brewing coffee. We were served French press coffee, Chem-x coffee, vacuum brewed coffee, and a cup of Keurig coffee. Plus the barista explained the different beans to us. I found all this very fascinating. The vacuum contraption for brewing coffee was awesome. I will always love my French press though! At a Yelp event, they never let you leave empty-handed so we loaded up on some fresh coffee. Plus the staff was passing out baked goods so I grabbed a ginger cookie for the road. Matt went with the oatmeal cookie. As we were headed out, we were given gift boxes with a Peet's coffee travel mug, a bag of coffee beans, and a few Keurig K-cups. Our coffee supply should last us a while now! In my caffeine-fueled state, I managed to knock out quite a few wedding tasks. Seriously I edited my programs, called a ton of people who "forgot" to return RSVPs, did one load of laundry, and cleaned part of my house. Friday was a little rough due to little sleep the night before but I just fixed that with more coffee. Thanks Yelp and the new Chicago Burbs community manager, Jacqueline B., for another great event!